Every vehicle has a different need in terms of how oil is pressurized. The oil pump is used in internal combustion engines in order to circulate the engine oil under pressure, which helps to lubricate the bearings and also assist in cooling the engine. What’s more important, especially in high pressure oil pumps (HPOPs), is that the pressurized oil takes on another role – used as hydraulic fluid. This will then power a variety of small actuators under the hood of various systems. 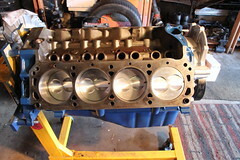 Inside of the 7.3 Power Stroke engine, the high pressure oil pumps will be used to power variable valve timing systems, the timing belt and tappets in the camshaft. The 7.3 L diesel engine was introduced in 1994 when Ford released its new model year of Econoline vans and Heavy Duty pickup trucks. This new engine replaced the 7.3 IDI turbo, which was completely different in all regards except for the displacement size. The Power Stroke engine has a lot going on because it is electronically controlled with a direct fuel injection. The engine has been placed inside of manual and automatic transmission trucks. The models released in the mid-1990s had hydraulically actuated fuel injectors and the high pressure oil pump was used to create the needed pressure so the fuel injectors could fire as they were supposed to. The Powerstroke was responsible for utilizing a HPOP with a 15 degree swash plate angle. With the controlled injection, it was possible to reduce the ‘knock’ common with the sharp combustion. As time went on, engines were producing more horsepower and had to reduce the exhaust gas temperature. To ensure this happened, the HPOP output increased significantly with a 17 degree swash plate angle, which also allowed for injectors capable of a higher flow. High pressure oil pumps are nothing new. While they are used in a variety of ways, it is up to the engine design to determine what kind of pressure the oil pump needs to be capable of. The higher the performance of the engine, the more stress will be placed on the lubricating system. This means that the oil pump needs to be impressive enough to lubricate without causing engine damage.